IG is a UK binary options broker offering trading opportunities in Forex and binary options. The IG Group is a company that was founded in 1974 and, with over 40 years of experience. It has proven itself as one of the top financial instruments provider by winning many prestigious awards. The broker offers premium tools and trading conditions which are almost sure to bring excitement and profit to all traders. Firstly, the Demo account is very easy to open and use. The account offers 10,000 virtual funds which function like points you can use to place trades. While this is, of course, a limited amount you can use the funds for as long as you’d like to learn the ropes by making your first trades with the broker, practice your skills, and develop a viable strategy before risking your investments. While we found the points structure very useful, it might take some time to get used to it and later transfer to real money trading. You can open a Real money trading account by depositing at least $200, which provides a unified account for all the clients, with the same features and traits. The account provides access to the many assets, an educational center, interesting and useful trading tools, and high-quality customer support. IG does not offer deposit or trading bonuses and, while some consider this a down-side, we found this a sign IG is a place for traders rather than gamblers. The terms and conditions have no withdrawal requirements hidden in fine print and trading opportunities are very transparent, with funds as safe as possible with no chance of getting locked in your account because of bonuses you might have accepted. 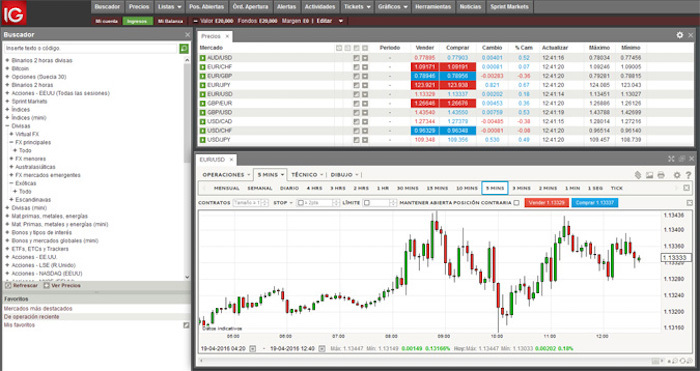 IG uses a proprietary trading software with an innovative and interesting design which delivers good execution times. While you might take some time to get used to the platform, it’s highly intuitive and user-friendly. The platform is supported on various mobile devices, including phones and tablets. The website looks sharp and professional and we enjoyed the information displayed in tabs and drop-down menus although it can be somewhat confusing for the new traders. The offer is very diverse when it comes to binary options trading assets and expiry times but there are no expiry times under five minutes so there are probably better spots for traders who look for short-term and fast-paced trading opportunities. The options trading includes high/low, one touch, ladder, target, and tunnel types. IG is a broker based in the United Kingdom and offers services to a huge customer base around the world. The broker is authorized and regulated by the Financial Conduct Authority (FCA) under register numbers 195355 and 114059. IG has offices in more than 15 countries worldwide and it’s authorized and regulated in many other important markets such as Australia (ASIC), Singapore (IG Asia Pte Ltd regulated by MAS) and New Zealand (with a company IG Markets Limited). IG is thus a global financial services provider and offers site and customer support in many different languages. The customer care is top-notch with the broker, with support channels via e-mail, telephone, and site chat which is available 24/5 and highly responsive. IG has a great educational center, offering both simple trading elements as well as more advanced tutorials to help make the best out of your investments. The video guides will provide instruction on all features available and there are also educational materials on different trading strategies as well as analysis tools. FAQ section seems to be still in developing phases where we can see some obvious missing details on banking, trade requirements and more. However, the customer support is very competent and available to answer any questions you might have, while also being able to solve technical and other issues users face. Banking is very easy and straightforward with IG, where they allow many different payment methods for both deposit and withdrawal. The traders can use bank wire transfers, cheques, as well as a wide range of credit and debit cards including Visa, MasterCard, Maestro, Electron and much more. While not all payment methods will be available in all countries IG offers the services in, it’s safe to say that this is one of the most diverse offers when it comes to transactions. The IG broker does not accept 3rd party payments processors for further safety and fund security. To restate this, all traders will have to provide personal info and trading experience as well as confirm their ID through a verification process. The minimum deposit is $200 and the minimum withdrawal is $100. Traders can also make smaller withdrawals but with certain fees and through a procedure that includes a phone call. There are also fees for different deposit and withdrawal methods so it’s best to check these out before depositing. The customer support is very informative and you will be able to easily get to details on your preferred method. For example, the fee for credit card transactions is 1,5%. Our only objection here is that we’d have to actually contact the support to get specifics, while the site FAQ on banking is practically non-existent. However, we do expect this to be updated with the new FAQ section. Founded in 1974 and online since 2003, IG is one of the top financial service providers in the United Kingdom. Authorized and regulated by regulatory bodies around the world, the broker provides favorable conditions and overall safety and security. With a minimum investment of just $5 and great returns, IG becomes a top spot for different types of traders through one account type. The withdrawal times range from three to seven days and largely depend on the payment methods you use. The high-quality service is well-rounded with a competent and friendly customer support there to enable the best user experience. 7 Binary Options review: IG: 4,5 stars.